I call it crazy Thursday. Actually, I love Thursdays. It's the day before Friday, why wouldn't you love it?!? Anyway, I call it crazy Thursday because of the sheer craziness in logistics in getting everyone where they need to be on time. I wouldn't have it any other way. 1. You definitely don't need to see me without makeup. 2. 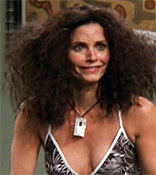 Jillian's hair in the morning resembles Monica Geller in Barbados. 3. My bathroom is not exactly in photo ready condition. I spent the majority of my day right here. See my kiddos on the beach? It is the exact vantage point I had last week. With that view on my screen...I can pretend I'm still there while I sort through a sea of...emails. With a little break at lunch...I got my nails done. I went from never having my nails done...ever...to wanting them done once in a while. A full-timer reward? I went with a bold decision to try and pull off a chevron pattern like I see all over Pinterest. Yeah. Well, the girl that does my nails said she couldn't do it with shellac. Either that, or she was trying to keep me from looking like a dork? Well, instead...my nails look like a toddler. Jillian certainly loves the bubble gum pink with glitter sparkles. I aim to please. No picture again. It's bad enough I see them every time I look at my hands. Then it is the mad dash...get gas, pick up Myles, pick up Jillian, run to dance, and wait for Jillian to finish. Myles loves to play with his friends...and anything in my purse...while we wait. Home for dinner...leftovers. Baths. Fun. And of course...tonight...trying on her recital costumes! So very exciting! Hope your day was just perfect. Tomorrow is Friday...so if it wasn't...there is a pretty sure bet that tomorrow is going to rock. Oh those pics of the dance recital costumes bring back fond memories of my own childhood. Only sad thing, my first year of baby ballet, they put is in pink pants and suspenders instead of pretty tutus. My mom was so sad! Happy Crazy Thursday! Pants!?!? I have a hard time getting Jillian to wear pants on a normal day of the week!